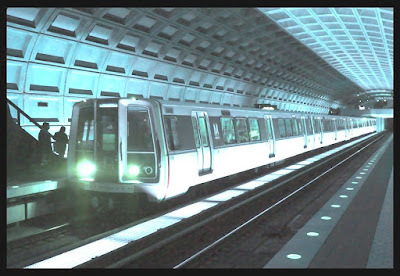 Hollywood is finally using the Washington Metropolitan Area Subway (Metro) system more. Directors love the distinctive look of Washington's subway -- its honey comb ceilings, long escalators and shiny modern trains with the "M" logo. But filmmakers have to follow Metro's strict rules in order to film there. This includes scenes in the film: No eating, drinking, running, jumping over fare gates, shooting bad guys on the tracks and no exceptions. Metro does not profit from the projects, but it gets bragging rights. The District made $63 million from film and TV shoots in 2007. Metro approves requests from Hollywood, TV producers, charities, banks, government agencies, and film students. Washington's transit system gets about 50 to five film requests a year. Of the 103 requests since 2006, Metro also rejected these four. Metro doesn't allow filming during rush hour or portrayals of anything illegal in the system. Metro officials do not want people to get the wrong idea. And train accidents are a sensitive subject because three Metro employees were killed in a six-month period in 2006.